The Red-tailed hawks are one of the most abundant birds in North America and are known for their predatory skills and adaptive nature. The ability to thrive so remarkably can be linked to how they're built, but also through the use of outside forces for support and sustainability. Red-tailed hawks and humans tend to have a mutualistic relationship. What that means is that humans and Red-tailed hawks have the ability to share a relationship that benefits both and harms neither species. The Red-tailed hawks' benefit from the humans by creating more nesting habitats and clearing the way for easier predation. Rodents tend to populate where humans reside and with the path cleared from human destruction, makes for an easy way for hawks to capture prey. Humans benefit from the Red-tailed hawks because they feast on pesky critters (mice and other rodents) that bother or infest human households. Red-tailed hawks have also been used for falconry or hawking by humans especially many Native American tribes. 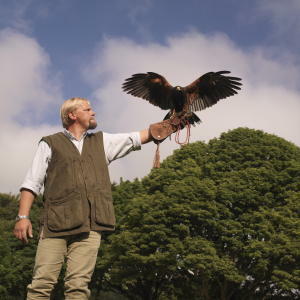 Falconry is the use of trained raptors (hawks and eagles) to hunt and provide game for human consumption. Even though the hawk’s life so far may sound like easy street, there will always be competition between different species especially between other birds that share the same qualities. Both the Red-tailed hawk and the Great Horned Owl are extremely adaptive predators that can live in diverse areas. Each species has a very broad diet, consisting of small mammals, have the ability to nest almost anywhere and are very similar in weight and build. Well you may be thinking, owls are nocturnal and feed during the night, how can they pose a problem to the Red-tailed hawk? Even though they may be on two different cycles, they still prey on similar species and compete for nesting areas. Great horned owls have even been known to occupy and claim other Red-tail’s nest. This sort of relationship is called "competition" where two similar organisms try to co-exist in the same environment. This leads to limited resources and eventually will cause one species to depart and try to find another area to inhabit. Being known as a predatory species, the Red-tailed hawk is feared by many, but to others they are a perfect host for reproduction and survival. Simulium canonicolum or blackfly, is one species that have been known to cause mortality in young hawks. This type of interaction is parasitism, where one species benefits while the other is harmed. 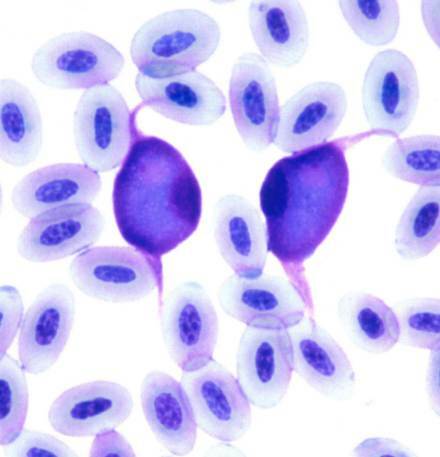 These infestations can cause a Leucocytozoon infection or a blood protozoan that can cause anemia or loss of red blood cells and body fluid. Find out some fun facts about the Red-tailed hawk.